There are very few certified organic cocoa growers in Africa. The risks of trying to grow an organic crop are great. Many of these growers choose to grow organically because they lack financial resources to purchase inputs including pesticides. With financing of inputs, many of the current organic growers are likely to switch to use of conventional methods with pesticides due to greater yields, income and less risk. “…the total market share of organically grown cocoa is still relatively very small and accounted for less than 0.5% of the total production in 2002 to 2005. For producers who cannot afford inorganic inputs and who currently grow organic cocoa, there is a large amount of risk (both in price and in yield) involved with an estimated 30% lower yield compared with conventional (inorganic) production. The obvious challenge for producers to produce conventionally is to obtain credit up front to purchase inorganic inputs. 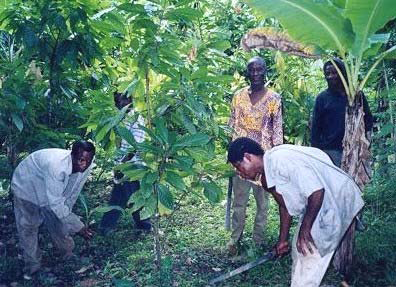 Given the advent of organizations like the Cocoa Abrabopa Association (CAA) established in 1998 in Ghana, credit is becoming more accessible to producers. Authors: Mahrizal, L., et al. This entry was posted in Pesticides and tagged Africa, cocoa, conventional farming, labor, Organic, organic cocoa, pesticides, yield by pesticide guy. Bookmark the permalink.